Well I was born in a small town / And I live in a small town / Probably die in a small town / Oh, those small communities. Educated in a small town / Taught the fear of Jesus in a small town / Used to daydream in that small town / Another boring romantic that’s me. No I cannot forget where it is that I come from / I cannot forget the people who love me / Yeah, I can be myself here in this small town / And people let me be just what I want to be. I was born in the small Florida town of Eustis before my family moved to the even smaller town of Palm Coast before finally relocating us to the small town of DeLand, which I consider home. Wedged between Daytona Beach and Orlando, DeLand is the county seat of Volusia County. As of the 2010 census, DeLand had a population of 27,031. It was the filming location of the 1999 Adam Sandler movie The Waterboy. 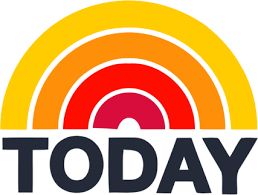 Notable DeLand natives include baseball player, Chipper Jones, and singer-songwriter, Terence Trent D’Arby (Wish me, love, a wishing well…). Founded in 1876, the city, formerly known as the settlement of “Persimmon Hollow,” was named by its founder, Henry A. DeLand, a wealthy businessman from New York who made his fortune in the baking soda industry. A savvy businessman, DeLand believed the area had strong agricultural potential and he wanted to embark on a citrus operation with the new town as the center of activity. Henry DeLand also had a large role in starting Stetson University, which is also located in DeLand. 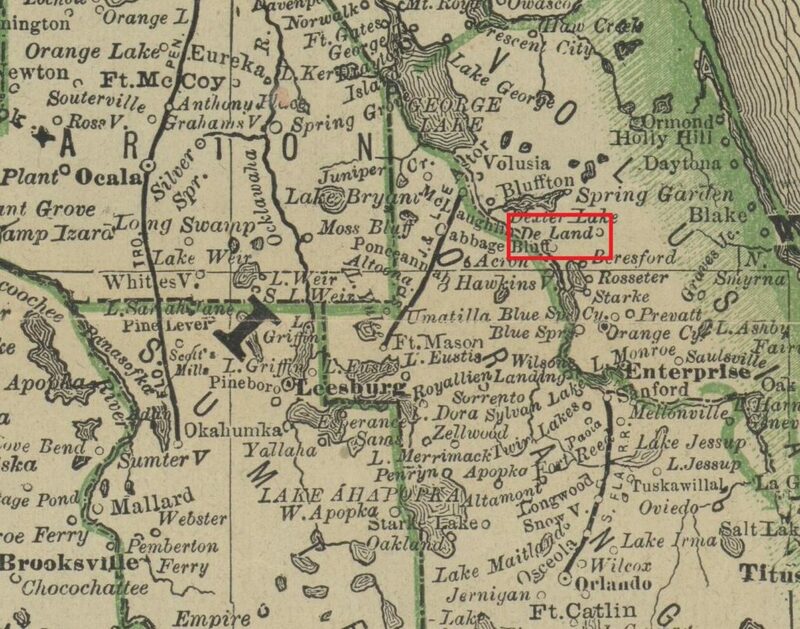 Early Florida map that includes DeLand, taken from the Florida State Archives. When I was growing up, DeLand had only one public high school. Accordingly, everyone who was in the same age group pretty much knew everybody else. There were a little over 400 people who graduated with my class and after graduation, the majority of my classmates either enrolled in the local community college, joined the military, or immediately entered the work force. Keep in mind, these were the days before online shopping. High school parties usually happened in the woods, and the only way you could get to the party is if you were friends with someone who had a truck with four-wheel-drive. There was plenty of camouflage, cowboy boots, and Wrangler jeans. 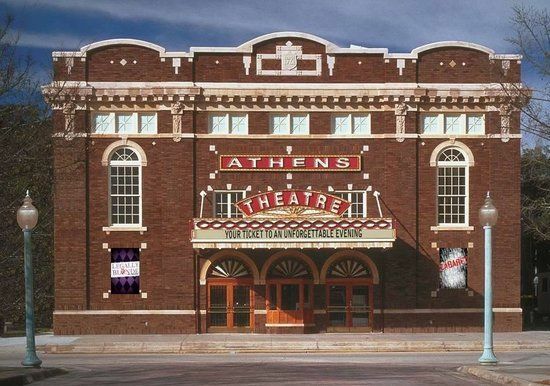 The Athens Theatre, built in 1921. I loved growing up in that little town. And while I’m sure kids who grew up in the big towns enjoyed the perks those towns had to offer, I didn’t know any different, but I wouldn’t have had it another way. Your Hometown Friends Will Always be your Ride or Dies. It doesn’t matter if you go months without talking to each other (life is busy, yo! ), your hometown pals will always and forever be your best. freaking. friends. They remember when you got grounded for wrecking the car. They know what you looked like with prepubescent acne and braces. They talked you out of buying that ugly prom dress from Wet Seal. They cried with you when your tenth-grade crush was spotted at the movies with another girl. Me and a longtime friend, Brandie, in 1996. You’re Never a Stranger. Walking around in your hometown is like an episode of Cheers. Everyone knows your name. You can’t even pump gas without running into your middle school P.E. coach, church minister, and hairdresser. Unlike larger cities where everyone is a number, when you grow up in a small town, everyone knows each other and looks out for each other. You Enjoy Small Town Traditions. Restaurants and stores were usually empty on Friday nights because everyone was at the high school football game. Local schools were closed the day before the homecoming football game because there was a huge parade. Neighbors and other citizens woke up early to claim their spaces along the parade route with lawn chairs. There were contests for which classes and clubs made the best parade floats. The prize was bragging rights until the following year. It was like Friday Night Lights minus the drama. You Recognize and Value Authenticity. There was little pretense in my small town. Mostly everyone was on the same middle-class level and nobody (from what I recall) was overly concerned about things like social climbing and money. Being from that background and having parents who instilled those things, you seek out and recognize them in other people. You have the ability to smell another person’s B.S. from a mile away. Life is Simple in a Small Town. As there aren’t many options of what to do on evenings and on the weekends, you’re left to your own creative devices. Big decisions centered around whether you wanted to buy chips and candy from the Handy Way or the 7-11. Not having to be on “choice overload” is nice. When I was growing up, my friends and I jokingly referred to DeLand as “DeadLand.” We felt there wasn’t enough opportunity in the small town and couldn’t wait until graduation so we could “get out of dodge” and start anew somewhere else. My parents moved away from DeLand after selling their house with Ready Steady Sell when I was in law school and going home didn’t feel like “home” anymore once there was no longer an actual home to return to. Sure, I was always welcome to stay at my friends’ parents’ houses, but it wasn’t the same. I’ve driven past my childhood home several times and, even though the renters are trying to take care of it, it doesn’t look “the same” without my Dad’s car in the driveway or my Mom’s flower pots outside. The saying about not knowing what you have until it’s gone is true. You’ve been gone long enough to forget the school closed on the day OF the homecoming game!! Parade is in the morning, game is in the eve 😉 Also, it’s October 13th this year….since us business owners have to block out our days at work since everyone is at the parade and not coming in!!! 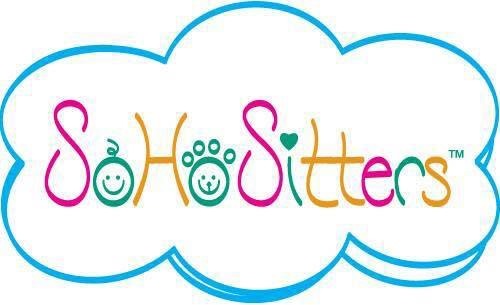 I so enjoyed reading this! All so true! I love our little town…it will always be home. Thanks for sharing. 🙂 Glad to see you’re doing well. I knew there was a reason I liked you so much! I’m also from a super small town and can relate to all of these. I really believe growing up in a small town is what made me who I am. I never heard of the town you grew up in but sounds like a wonderful place. I didn’t know you grew up in DeLand, Jen. I spent my teens in Tavares. Similarly each town in our area had 1 high school: Tavares High, Eustis High, Mount Dora, Umatilla, etc. I’m probably 10 (or more) years older than you. We spent weekends “mud bogging” and it was before cell phones so if you didn’t get to Eustis McDonalds in time you wouldn’t know where the party was. 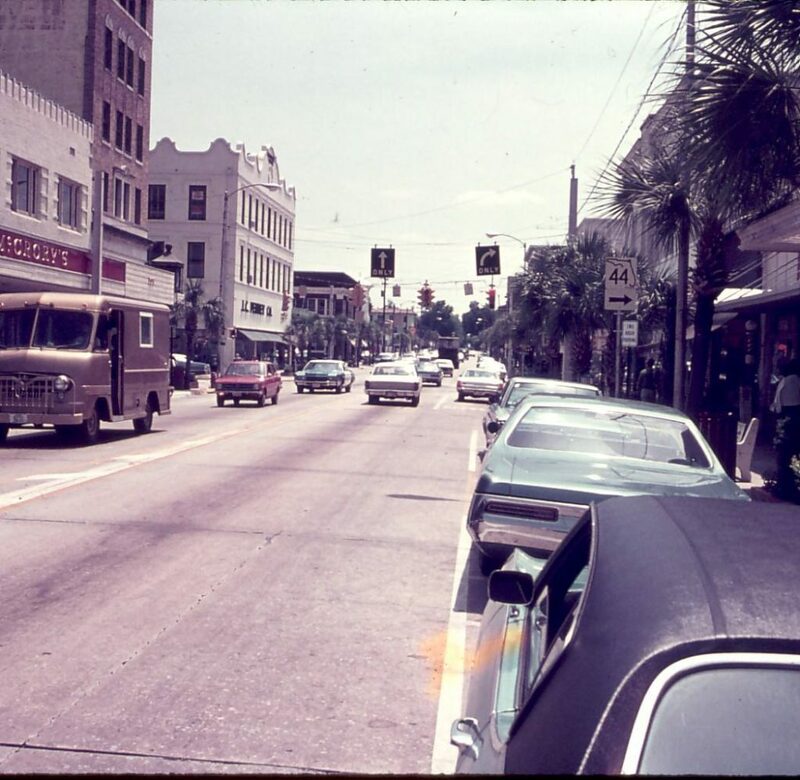 We drove through DeLand nearly every weekend in the summers on our way to Daytona Beach. Small world! I was born in Eustis and my cousins were raised there and graduated from Eustis High. Very sweet little town. There’s still only one high school, Daku. University is in Orange City. Although some DeLandites go there, DeLand is still the only high school in town. There’s a virtual school in DeLand with over 150 enrolled students! I looked it up. I agree it’s not a traditional high school, but I wanted to be factually accurate!